Okay, Okay. This isn’t strictly an ice-cream roundup. When the clouds clear and the skies open for Portland’s month-long summer, man cannot live on ice cream alone. Why limit the choices, especially when Portland is the midst of a great churning moment, with plenty of new lick-worthy options? No dairy? No eggs? No problem. 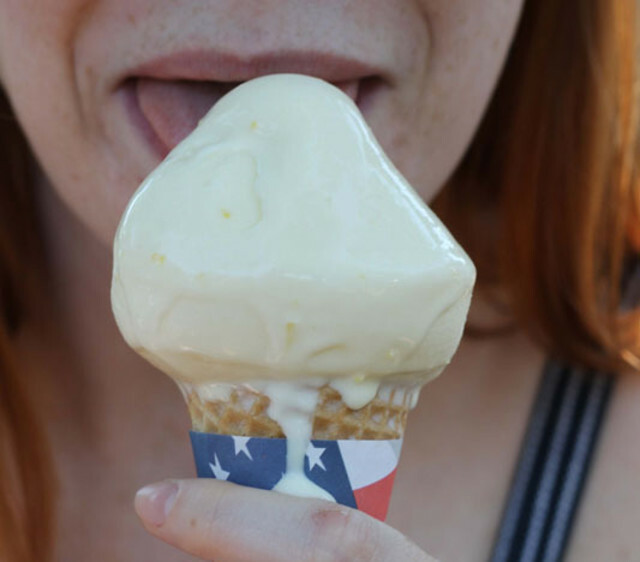 Through rain and shine, we slurped our way around the city’s emerging options, from airstream trailers to brick-and-mortar parlors, in search of the best new frozen treats of summer. Did we miss your favorite? Tell Eat Beat what we’re missing! 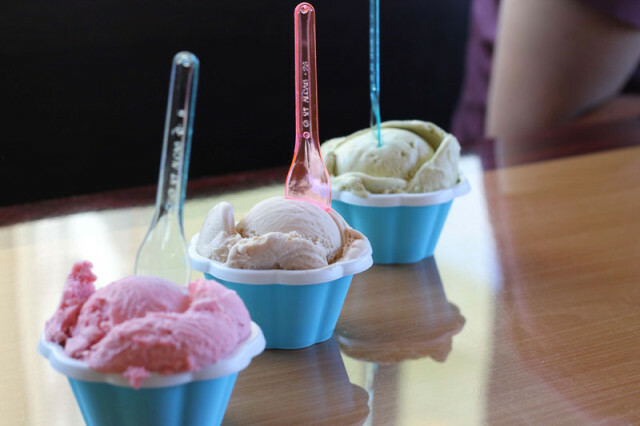 Ice cream has nothing on the fantastic gelato at Portland’s newest sweet spot, Alder Pastry & Dessert. Pastry whiz Matthew Zack spins out eggless frozen wonders that hold rank amongst the cases of moist cannelés and buttery croissant-like kouign aman. The experiments might include muscovado, with deep dark brown sugar, kalamansi, made with a wild lime from the Phillippines, or a simple scoop of concentrated rhubarb gelato with a sour bite and floral note. Don’t get attached to flavors though. Zack switches flavors up every few days. But the signature scoop is typically on hand: pistachio gelato, vivid green and texturally flawless, impressively focused squarely on the pistachio. Even after days of spooning through quarts of ice cream plummeting towards my waistline, I ate the entire thing. Some days are just too hot for ice cream, and that’s where Oregon Ice Works comes in. To find it, look in back of the SE 32nd Avenue & Division Street food-cart pod, where dozens of sweaty kids and sun-worn families line up to try Kevin Bell’s “Oregon Ice.” Bell got his inspiration from the mom and pop corner shops (affectionately known as bodegas nowadays) of Philadelphia, where he grew up sucking on colorful high-fructose “Italian Ice.” But this ain’t Philly. From his gleaming metal food cart, Bell blends fruit from local purveyors like Sterm’s Berry Farm in Corbett with water, sugar, and lemon juice to make the ultimate thirst quencher. 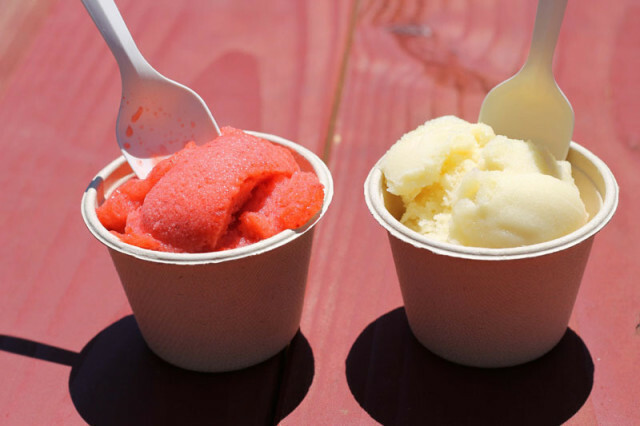 Flavors like Meyer lemon huckleberry and blueberry topped our charts: pure, undiluted fresh fruit and ice. Bell mixes and matches sweet harvests like a DJ, popping out a new flavor every Friday. In the fall, he transitions to his wintertime Oregon Soup Works with seasonal flavors like cranberry and pumpkin ice to keep the sunshine around a little longer. This cute-as-a-button cart on NE Alberta Street (and soon to be a brick-and-mortar) is Portland’s first hyper-local ice creamery. 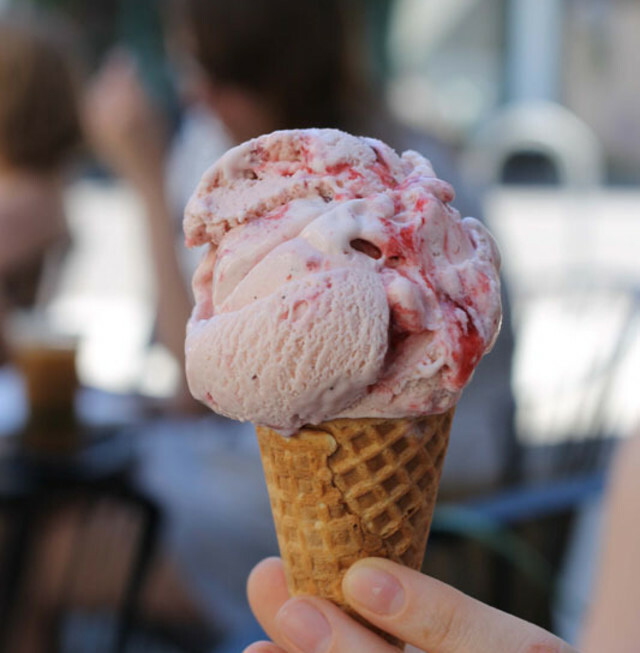 Their “farm-to-cone” operation churns out some of Stumptown’s most inventive flavors, from honey balsamic strawberry with cracked black pepper to Laurelwood Brown Ale with Olympic Provision’s bacon. 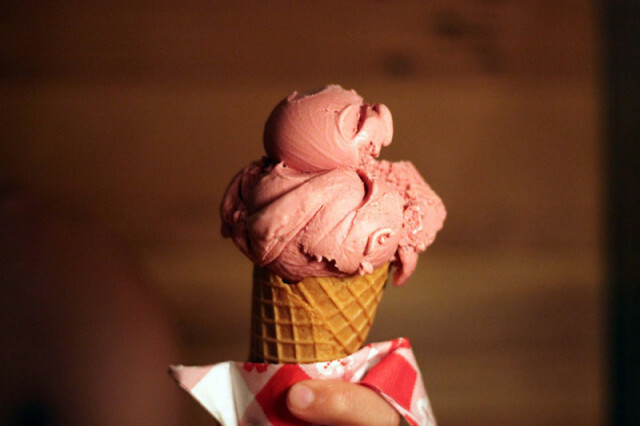 But Salt & Straw is best when it’s not too over-the-top. This is killer, photogenic ice cream with a local pulse. But some of the more adventurous scoops can take their toll on your taste buds after a few licks. On a hot, sticky afternoon, our savior was the lemon basil sorbet, icy and bitter with citrus and shivers of peppery, bright basil. This is a place to watch. Housed in the Good Food Here pod at SE 43rd Avenue & Belmont Street, this baby-blue ice-cream truck was a hit with the insatiable fressers (Yiddish for gluttons) in my ice cream crew. 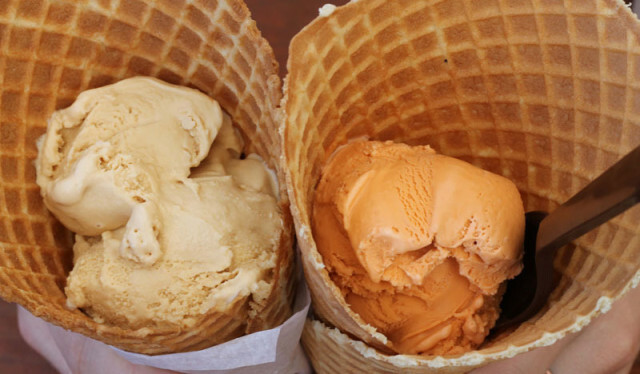 A warm, freshly pressed waffle cone arrived so large it resembled an old Elizabethan ruff. Inside, a mound of maple cream studded with bacon bits and a second scoop of caramel apple ice cream, sour and bright from its Washington cider roots. Both flavors were delicious, albeit almost unreasonably rich and filling. Those who can only manage ten licks out of fifty might opt for the coconut lemon saffron sorbet, a winning combination of creamy coconut and balanced spice. The North Station food cart pod at N Killingsworth Street and Greeley Avenue feels more like a neighborhood commune than a bunch of vendors. The kids whizzing around in wheelbarrows with chocolate smeared all over their faces assured me I was in the right place. The Scoop ice cream truck has plenty of solid flavors, but the standout by far was the salted caramel ice cream; just the right balance of salty and sweet to make your mouth do back flips. On SE Hawthorne Boulevard’s lonely lower stretch, amidst the quaint pastel housewares and curated selection of hard-to-find magazines, Oui Presse owner Shawna McKeown cranks out small-batch pastries and carefully poured Americanos for her regulars. She recently added ice cream to her mix—there are only two flavors for now, but both are to die for. 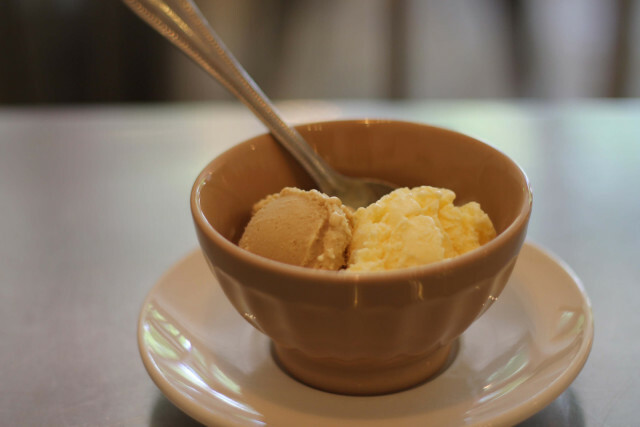 The butterscotch pudding ice cream is fantastically creamy, full of assured bites of brown sugar and sweet, sunshine-yellow butter. The scoop of crème fraiche ice cream brings a surprising tang, a delicious acid that cuts through the heavy dairy. Let’s hope this is just the beginning.